This IBM® Redpaper™ publication describes the performance tuning guidelines that can help you successfully deploy SAS business analytics on IBM POWER8® processor-based servers. The paper describes the test environment, the testing that was performed, and SAS analytics performance results. The test environment includes the SAS business analytics solution running on an IBM Power System S822 (8284-22A) server with IBM AIX® 7.1 operating system and IBM XIV® Storage System Gen3 with IBM Spectrum™ Scale (formerly IBM GPFS™). 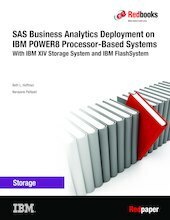 This paper also describes the deployment of SAS analytics on IBM POWER8 processor-based servers with IBM XIV and IBM FlashSystem™ in a hybrid-storage model, along with configuration and tuning guidelines.